With the IPMS Nats two weeks behind us, it's time to look for new ideas and inspiration. I've been wanting to write about the various "reality" shows about soldiers that have been airing this year. 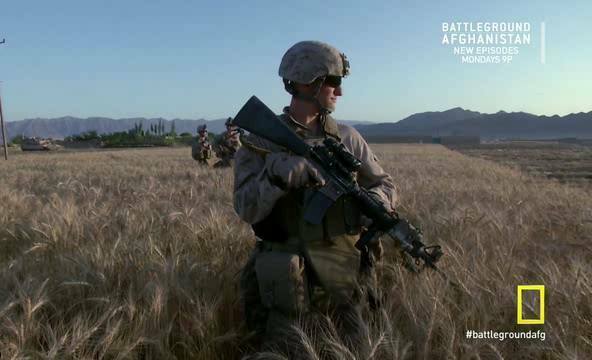 Three of the best are on the National Geographic Channel -- Inside Combat Rescue, Battleground Afghanistan, and Eyewitness War. Each show embeds you with a combat unit thanks to the portability of digital video recorders such as the GoPro. There's no narrator. There are no scripts. It's just the camera mounted on a soldier's helmet as he goes into battle. You've probably seen these shows; the live action captured by the cameras is explained through a series of integrated interviews with the participants who survived the action. This is television at its best. Most of us have never experienced combat, so our impressions are based on what we see in movies, and even well researched movies like Saving Private Ryan may fail to capture what it's like. With that in mind, several aspects of the combat shown on these TV shows struck me, and I share them with you. More often than not, you can't see the enemy you're shooting at. When the bullets start flying, the best you can do is aim in the general direction that you think they're coming from until someone can get a fix on the enemy's specific position. I can only imagine how frustrating that must be. Most firefights are fought at a great distance from the enemy, often 200-300 meters or more. This makes locating the enemy extremely difficult, much less hitting him. That our soldiers can do so, is incredible to me. Some of the engagements shown on these shows can be very lengthy, and the possibility of running out of ammunition is a frightening reality. So much ammo is spent just to pin the enemy down that in time you have very little left with the hope of actually taking him out. The capabilities that UAVs bring to the battlefield has revolutionized the way war our soldiers conduct war. Although the screens are blurred in the show for security reasons, it's clear that battlefield commanders have an incredibly clear image of the enemy's activities thanks to the Predator and similar aircraft. This real-time data allows soldiers to engage the enemy in ways their predecessors could only dream of 60 years ago. Or even 15 years ago! Air assets end pretty much every firefight. When the troops on the ground can't get a foothold, it's impressive to see how quickly a single machine gun burst from an Apache or LGB from an F-16 can give our troops the upper hand. As quickly as allied forces can act on a situation, it seems to me that most battles are relatively indecisive. Unlike earlier wars, we're not advancing in a single direction and taking control of land and towns as we go. The entire exercise looks very hit or miss, and our soldiers are making the best of the small victories along the way. I can't help but feel bad for them when "winning" this war is such an unclear goal. You can find these shows on Amazon Instant Video.